What comes to your mind when you hear the word India? Goa, elephants, Indian tea, Bollywood, Buddhism? Nothing technology-or online-related, we bet. However, the digital revolution is transforming the whole world and India is no exception. To see that, one only has to look at the latest digital news from India. For instance, the Indian government plans to roll out 5G technology by 2022. And did you know that in July, 2018, Samsung India opened the World’s Largest Mobile Factory in Noida, a satellite city of Delhi? These news are truly remarkable. All this was made possible thanks to the political campaign called Digital India. Its initiatives include e-Shopping, e-Education, e-Health, e-Signing, etc. The latter will be the main topic of our article today. So, what is digital signature in India? Can you legally sign documents online with this technology? Let’s check it out! In a nutshell, it is a political campaign that was launched by Narendra Damodardas Modi, Prime Minister of India, on July 1, 2015. Its main purpose is to improve digital literacy of Indians and to provide villages with high-speed Internet connection. Also, the key point of the e-Governance plan is to make all the government services accessible online. Among these online solutions are electronic and digital signatures that allow Indians to sign any documents online. What is the current status of online electronic and digital signature in India? 1) Digital signature. This type of signature has to be supported by a crypto-system. It utilizes private and public secure keys that encrypt the signature and become a special form of validation. These keys are unique to each person. Indians can obtain their digital signature in the form of a digital certificate from a Certifying Authority. The certificate can have different levels of security, depending on your needs. Digital signatures in India are based on a digital ID and are viable for 1 to 2 years. 2) Electronic signature. This type of signature in India has to combine Aadhar identity number with e-KYC service. Aadhar identity is a unique ID number of Indian residents. If an Indian has this number, they are free to use e-Signature to sign documents. E-KYC, in turn, stands for an electronic Know-Your-Customer service, which integrates with e-Signature software to verify your Aadhaar card. When signing a document, a One-Time-Passcode will be sent to your mobile number. As you can see, the digitization of India gains momentum day by day. One of the main objectives of the Indian Government is to make India’s economy completely paperless. Legalizing electronic and digital signatures takes an important place in this process. E-Signature software is easy to use and allows businesses to go paper-free. You can learn more about the benefits of paperless office in our previous piece. 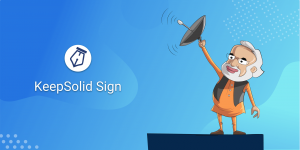 And if you haven’t tried electronic signature, we highly recommend you to practice on an e-Signature solution with advanced level of security, like KeepSolid Sign. It is a top-notch software that allows you to collaborate with your partners, track document status, and even work in the offline mode.